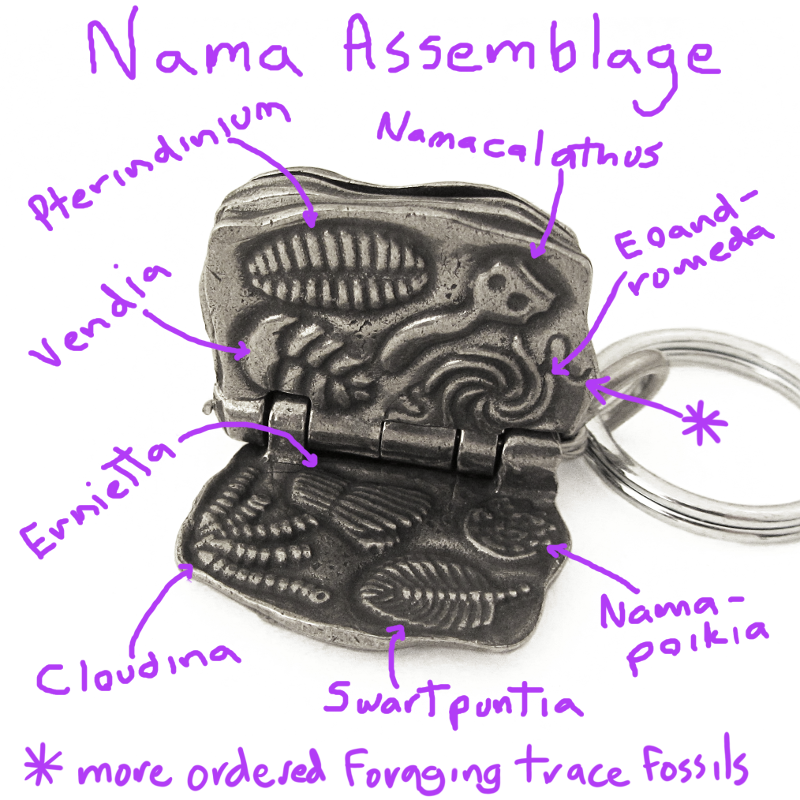 Here's an in-depth look at our Ediacaran Biota Fossils Keychain, to-date, the most ambitious fossil formation piece I've made. 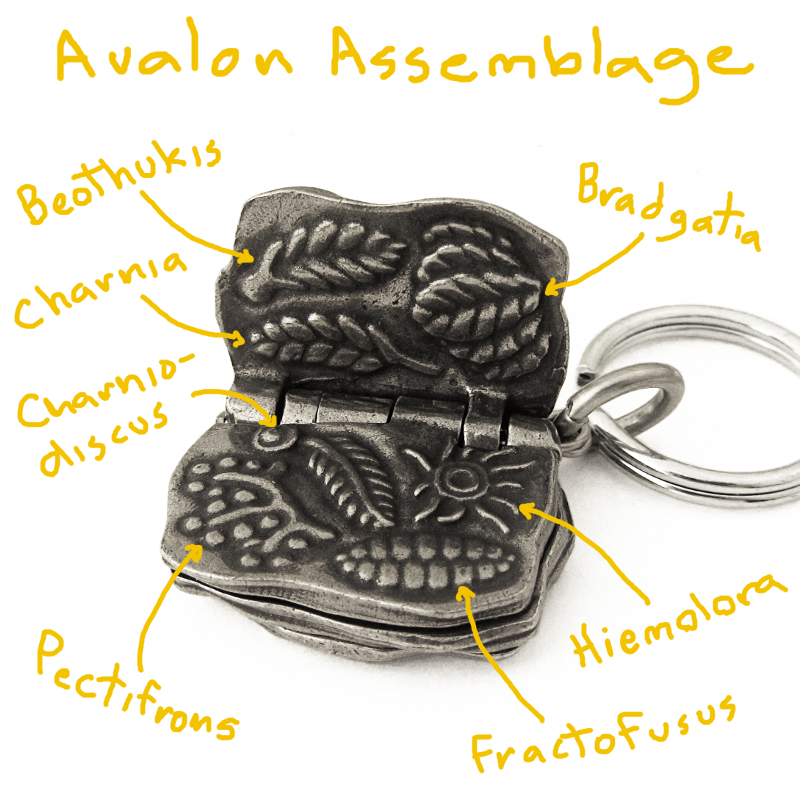 As with my earlier fossil-lockets, I originally conceived this to represent a single rock formation, the Ediacara Sandstone. After just a little research, however, it became clear that to do this would necessitate the omission of many lifeforms which simply had to be included! Some unique property of the biotic/physical world in the Ediacaran Period (beginning 635 million years ago) resulted in marvelous fossil preservation not just in one place, but in various sedimentary rock types laid down in diverse conditions, and at locales worldwide! 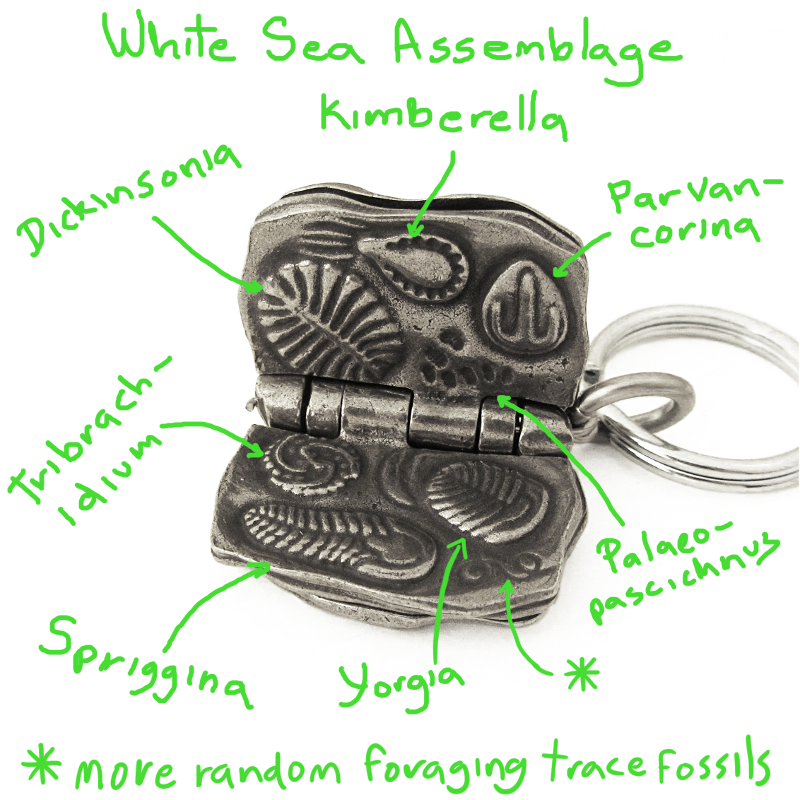 As more and more fossils of what has come to be known as the "Ediacaran biota"* were discovered, Paleontologists found that they typically occurred in three main "assemblages", roughly corresponding to the time and conditions of their formation. The earliest assemblage of Ediacaran lifeforms is named for the Avalon Peninsula of Newfoundland. Conspicuous among these fossils are the mysterious "rangeomorphs". Members of this group (which includes the well-known Charnia) display a strange growth habit which seems to be governed by a fractal, or "self-similar" algorithm, and are unlike any later organism. What the rangeomorphs are is an item of hot debate among paleontologists, but whatever their identity, it is certain they are not plants, since the sediments they are found in are known to have formed in the perpetual dark of the deep sea. The next assemblage is named for the White Sea of northern Russia. While rangeomorphs are still present here, they live among a much more varied collection of creatures. Some of these organisms seem almost familiar, inviting speculation as to their relationship to living forms. In addition to this increased diversity we also see the first "trace fossils", trails left in the sediment; the first known evidence that macroscopic life had begun to move! The last assemblage of Ediacaran lifeforms is named for the African nation of Namibia. Here, the diversity of creatures has grown greater still, and among them we see Cloudina, the first known reef-forming organism. Another interesting feature of this layer is that the trace fossils, presumed to be foraging trails, have become less chaotic, evidence that macroscopic life was becoming more complex in behavior as well as in form! *This was earlier referred to as the "Ediacaran fauna", until it was noted that we could not be certain that many of the organisms which left these fossils were, in fact, animals.